Thirty four hundred per day. I thought, per day? No, this can't be true. Unfortunately, I was wrong. Over thirty four hundred babies are aborted in America every day. Wow! And yet, abortion obsessed liberal democrats are lorded as champions of black America. Meanwhile, MLK's niece, Dr Alveda King who has committed her life to ending the genocide of black babies is vilified, called a 'traitor to her race" and a "sellout" because she is a black republican. I feel like I am living in Bizarro World. Enemies of black America are promoted as heroes; true friends are trashed. President Obama enthusiastically supports Planned Parenthood. He has chosen to ignore the disproportionate number of black abortions, which is in essence, black genocide. 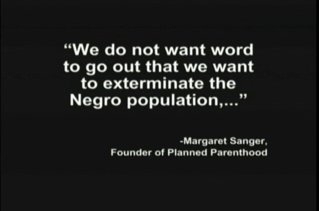 Why would America's first black president rally around an organization founded by a racist committed to reducing "specifically" black births? The harsh reality is more callous then Obama's naïve "hope and change" disciples can comprehend. So while the liberal democrats support an organization whose mission is to kill as many black babies as possible, most black Americans have been duped by the liberal media into believing conservative republicans are their enemies. Lord, help us. Conservative talk radio show host Andrea Shea King is a dear friend of mine. Andrea received a remarkable phone call a few years ago. Years earlier, pregnant at 15, Andrea made the extremely painful decision to give her baby up for adoption. Forty three years later, Andrea received a call from her son. His opening line, "Hello mom, its me." The phone call lead to a wonderful reunion. Andrea met her son, his lovely wife and is the proud grandmother of the most beautiful, talented, smart and wonderful grandkids in the world. And the icing on the cake, Andrea's son is a conservative! Taxpayer funded abortion is one of many hidden "far left progressive" agenda items buried in Obama's Health Care law which a federal judge ruled to be Unconstitutional. Regardless of your political view of abortion, forcing taxpayers who morally oppose abortion to fund them is beyond arrogant, evil and down right tyrannical. We MUST repeal Obamacare.